Reaching for the sky Arxiu. A breathtaking view of the Colla Vella dels Xiquets de Valls, who won the 27th Castells Contest, for the first time after 18 years, taking the place of their great rivals, the Castellers de Vilafranca. For those who have never seen the human towers contest, it is definitely a must-see and an amazing experience. 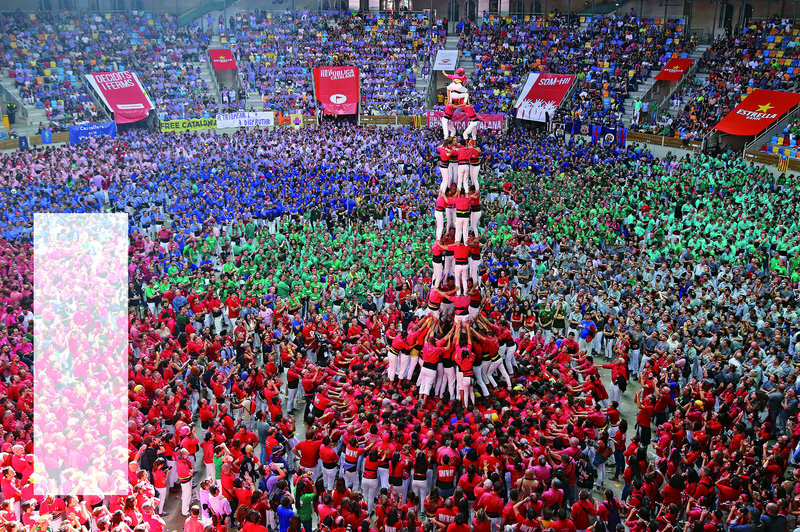 Tarragona’s Tarraco Arena Plaça was packed with hundreds of members of the colles castelleres, all dressed in different colours, and performing their human towers in front of an audience of thousands of people. A unique display of courage, effort, teamwork and common sense, definitely worth watching at least once in a lifetime. The castells tradition, passed down from generation to generation since the 18th century, is originally from Valls (Tarragona), and in 2010, the castells were inscribed in the Representative List of Intangible Cultural Heritage of Humanity.